Copper Farm Sinks hand-crafted and custom made in the USA. No need to dry our copper sinks after each use like all the imports require. Why? My copper sinks drain properly so water doesn't stand in the sink causing unsightly marks. I also naturally weather the interior of my copper sinks so there is no " fake finish" to wear off. If the interior of a copper sink is not the color of an old penny, you will have to dry your sink every time and never leave acid containing foods in the sink. Why? Their artificial finish will wear off and will never go back to the original coloration. Have you ever seen an oil rubbed bronze colored penny? My natural patina will always come back and blend in no matter what you do to the interior of my copper sink. Why are we the only ones doing this? The answer is simple - it is time consuming and adds to the cost of the sink. Doing it right is not cheap! Doing it right, however, reduces your sink maintenance by over 95%. You made it down this far... Keep going. It just keeps getting more fun! Scroll down to see a video of an imported copper sink. You will be amazed! 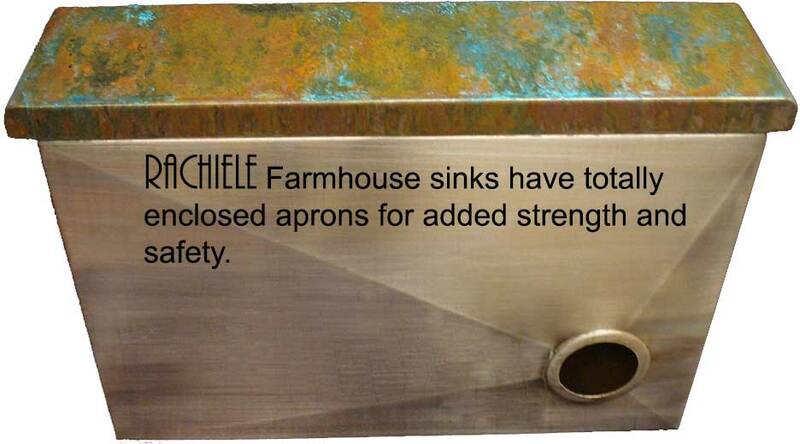 Rachiele copper farm sinks are nothing like imported copper sinks. No other copper sink has our ergonomic and functional features. 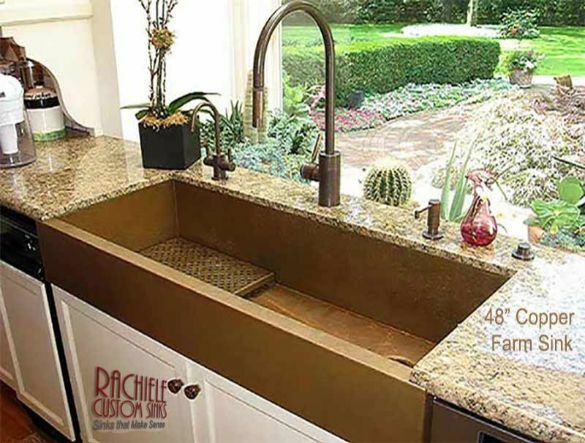 The attention to detail, the clean lines, the superior welding and the obvious design benefits, clearly separate a Rachiele copper sink from all others. From the 14 gauge Cold Rolled copper and the workstation options, to the rear corner drains and natural patinas... nothing is similar. 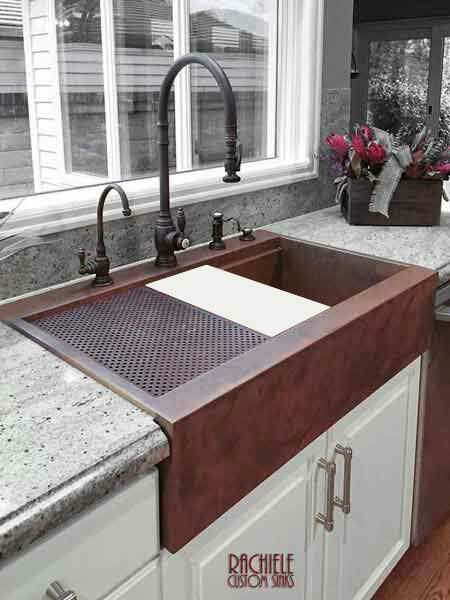 Our most popular design, until recently, was our Signature Series Workstation Sink, featuring an interior step to support a copper drain grid and a cutting board allowing you to do all of your food preparation on the sink instead of on the counter. Swipe photos to left to see all photos. 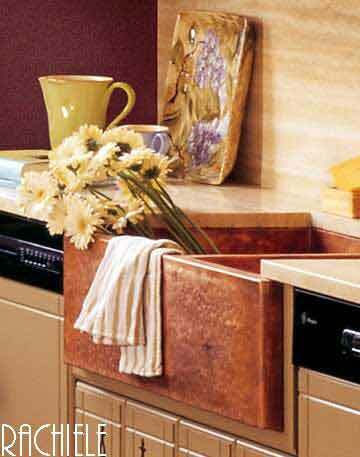 A Well Designed Copper Farmhouse Workstation Copper Sink allows for double roll out trash storage under the sink. Exclusive to Rachiele because my sinks are 8" deep. 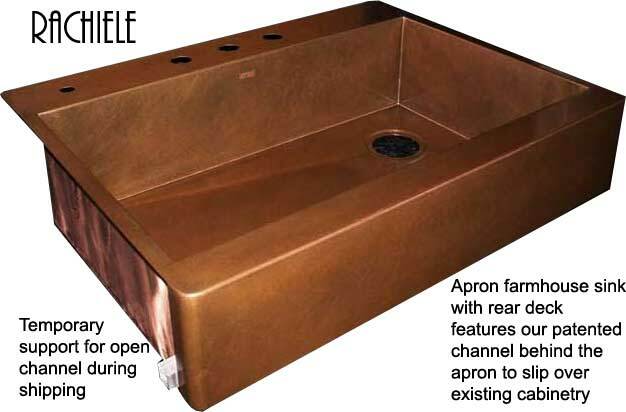 All Rachiele copper sinks feature an 8" deep single bowl with rear corner drains. Many ask why my sinks are 8" deep. The answer is purely logical and deals with ergonomics. With a double bowl sink, or a sink with center drains, you rarely, if ever, work at the bottom of the sink. 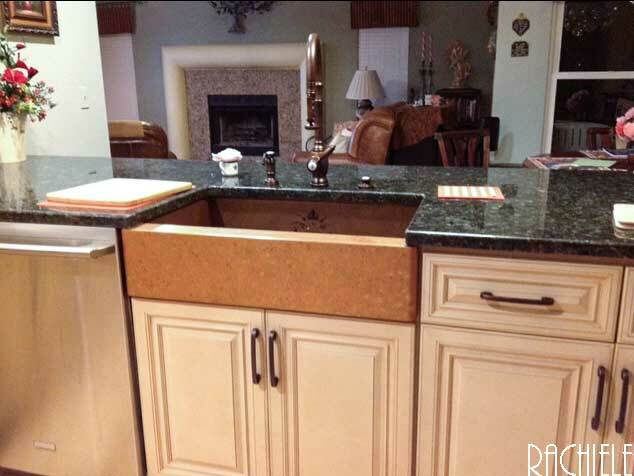 Platters and cookie sheets are placed in double bowl sinks at an angle. With my design, those items are placed flat on the bottom of the sink for scrubbing. You will be working at the bottom of my sink all the time. If the sink is even one inch deeper, I can assure you that you will get a back ache. Due to the rear corner drain location and the 8" deep bowl design of my sinks, you can put double roll out trash bins under the sink as shown in the photo. Think about it... most of your trash is generated at the sink. No more dripping over the counter top or floor when scraping dishes of left over food. Best yet, you now have available space for another very useful cabinet near your sink that would have been dedicated to trash storage. My copper farmhouse sinks make everything in the kitchen fun! 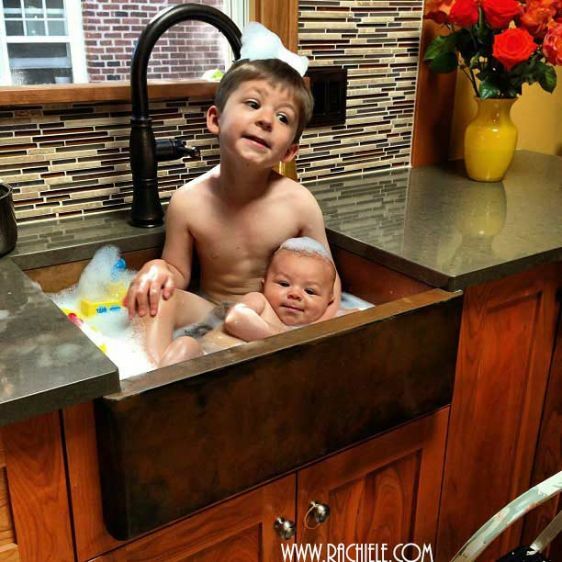 This copper farmhouse sink features a custom rustic patina and two lovely children! You can feel safe bathing children or preparing food in our copper sinks. 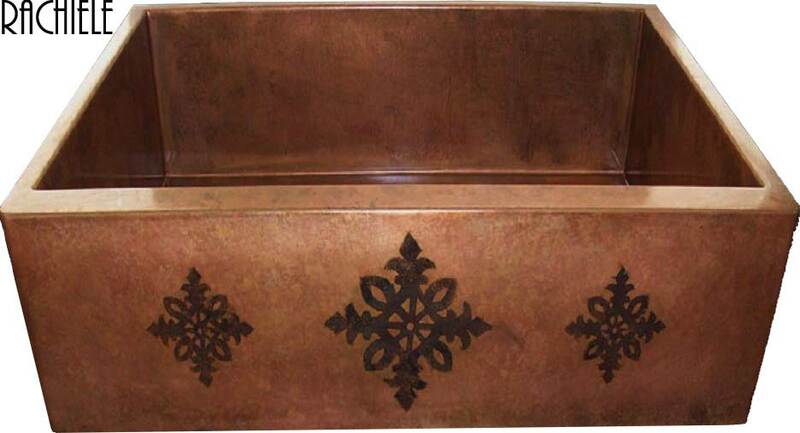 Our copper sinks are made of virgin copper mined and manufactured in the USA. 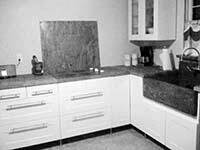 We are the only company that can offer a drop in retrofit apron or farmhouse sink in copper or stainless in existing cabinetry. Easily remove your existing sink, make a few easy cuts in the counter top, remove the existing false drawer head(s) and my apron front sink slips right over the face frame of the cabinet. My patented design has a channel behind the apron that slips over existing cabinetry. The sink is totally custom sized to fit your situation. We replace outdated sinks almost daily. Back in 1999 or so, I patented a design for a farmhouse sink where the apron can be shortened along with a 1 inch channel behind the apron that slips over the face-frame of the cabinet. Simply remove the false drawers and my sink slips in place. Every one of these sinks is custom designed to fit each situation. You will work with me, Dino Rachiele, from start to finish. 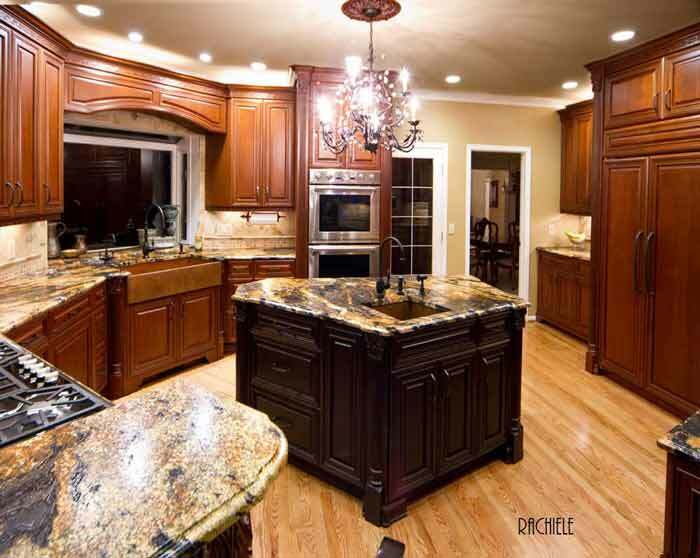 My background as a professional kitchen designer allows me to understand complex cabinetry and countertop issues. These installations (hundreds) have all been simple and flawless. Our Signature Series workstation copper sinks feature an interior step to support various cutting boards and a copper drain grid. No more chicken juice on your counter tops! 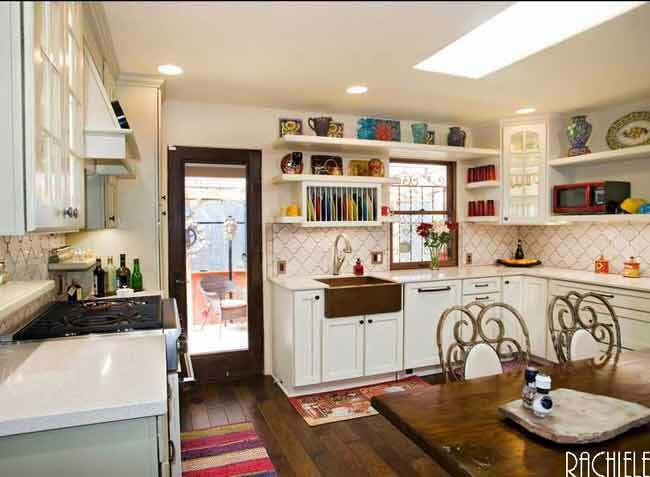 Our customer's father made the cutting board used in the sink in this photo. How cool is that? We can hand hammer our copper sinks. Our copper is 8 times harder than what the imports use. Our hand hammering looks more authentic. This is a 36" Signature Series hammered copper farmhouse workstation sink. The patina is weathered. Photo does not do this sink justice. It is absolutely gorgeous! Hand hammering one of these farmhouse sinks takes the better part of a day. Both sides of the copper are meticulously hammered by hand. This is a standard 42" copper farmhouse workstation sink with a weathered patina. Photos do not do this patina justice. It is absolutely gorgeous in person. Each sink is uniquely beautiful. Our Weathered Patina is one of my favorites and happens to be our least expensive patina too! Photographs do not capture the depth of this gorgeous patina. You just have to trust me on this one! Thanks to our patineur, we are able to produce breathtaking patinas on our copper sinks. Every rustic copper patina is a work of art, an original, a one-of-a-kind! Often, our sinks are the focal point in the kitchen - and even in the entire home. If you want a double bowl copper farmhouse sink... let's do it right! You might have to arm wrestle me for one. This was quite a large double bowl under mount farmhouse copper sink. If you are going to have a double bowl sink, better get a large one! Double bowl sinks smaller than 36" just don't make any sense to me at all. Neither bowl is large enough to place a cookie sheet or platter in to wash it. This double bowl sink with rear corner drains does the trick! 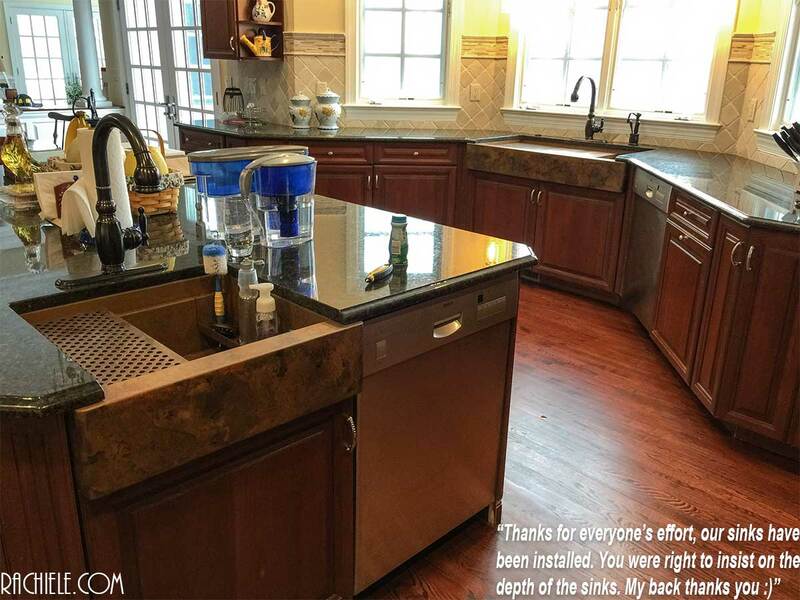 "Both my husband and I are surprised at how much we ended up loving the look of our sink in this kitchen. Not to mention its functionality! It's beautiful, and we have no worries, love the quality! It truly has become the center piece of our home. We used to have a stainless steel sink at our last home. I can't tell you how many times I looked down into that sink, disappointed at all the scratches. This sink sure stands up to the wear and tear from our family of five. I absolutely love that it is always changing it's beauty, this self healing thing is GREAT!" Faryal S.
This stunning kitchen features one of our 48" copper farmhouse apron front sinks with a copper grid drain insert. The faucet is a Waterstone PLP (positive lock pull down) in weathered copper. There is also a matching hot/filtered faucet and a soap dispenser. I developed this patina a few years ago. I have to say, it is stunning! 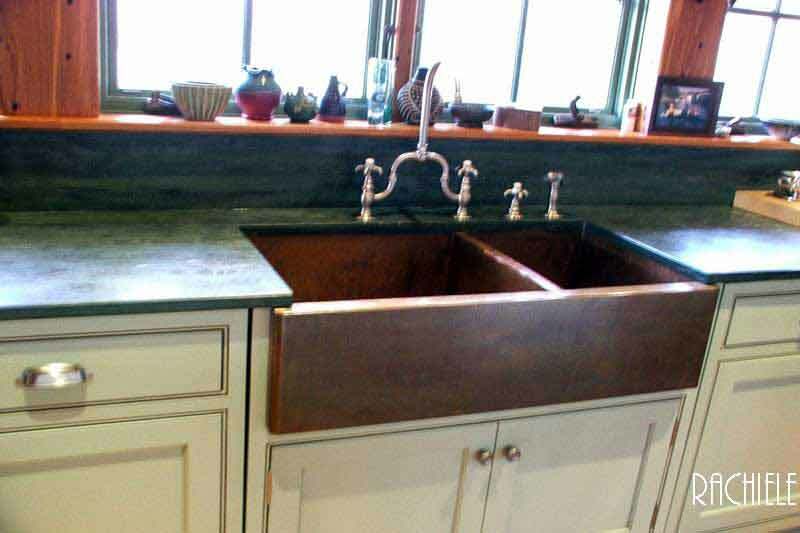 This is one of several custom patinas available on our copper apron front farmhouse sinks. Look at the top of any page to see "Patina Options". If you are looking for a functional sink that looks great - we have the sink for you. I realize there are other options out there at lower prices. I keep my prices as low as possible in order to offer a quality product without cutting corners. 100% value, no corners cut! 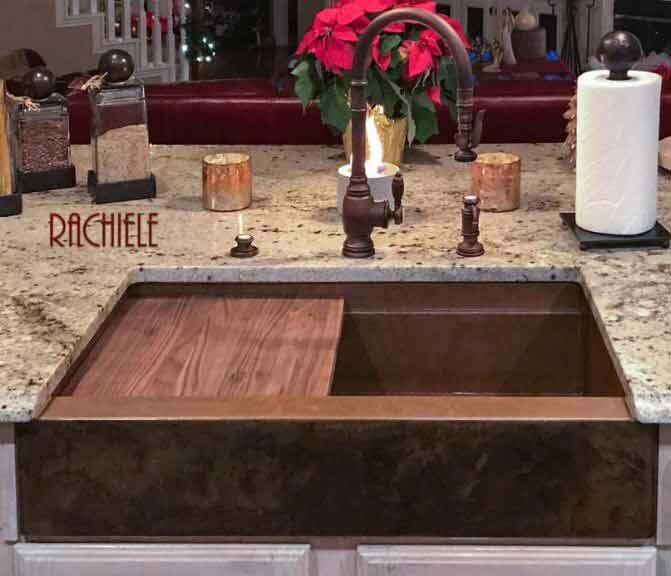 Your Rachiele copper farmhouse sink will be the focal point in your kitchen! 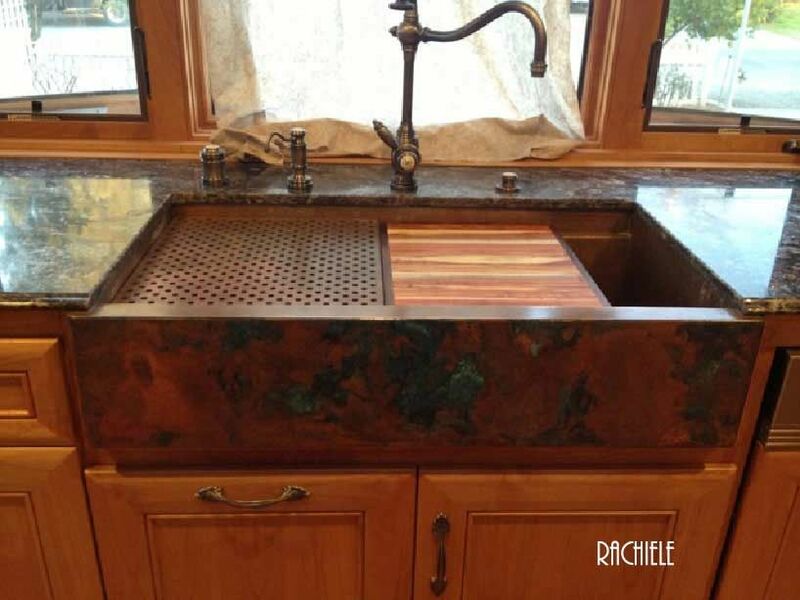 Every Rachiele copper farmhouse sink is unique. No two sinks look the same. This happens to be a drop in farmhouse sink in existing cabinets. The sink replaced a double bowl under mount sink. 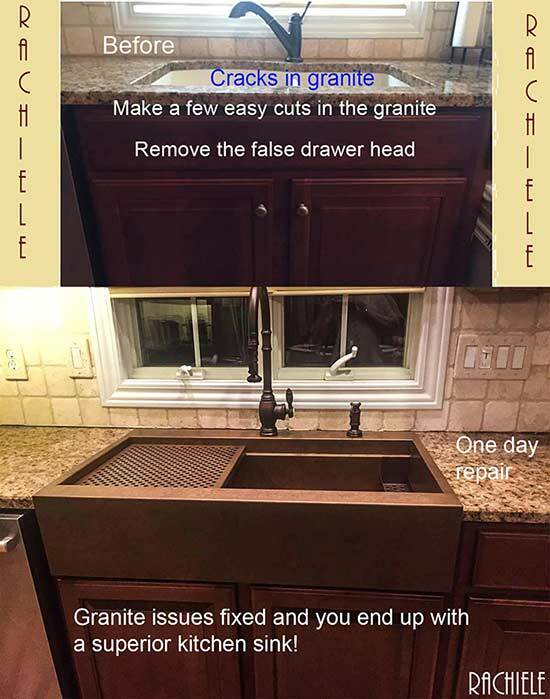 A few simple cuts in the granite, remove the false drawer heads and drop the sink in place. 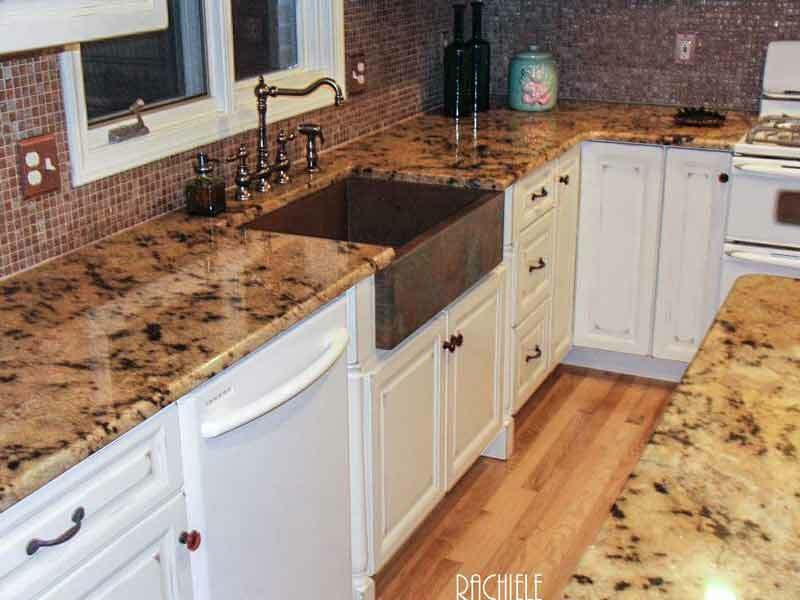 When you invest in a Rachiele sink, you are not merely investing in a sink... you are investing in a better way of life. 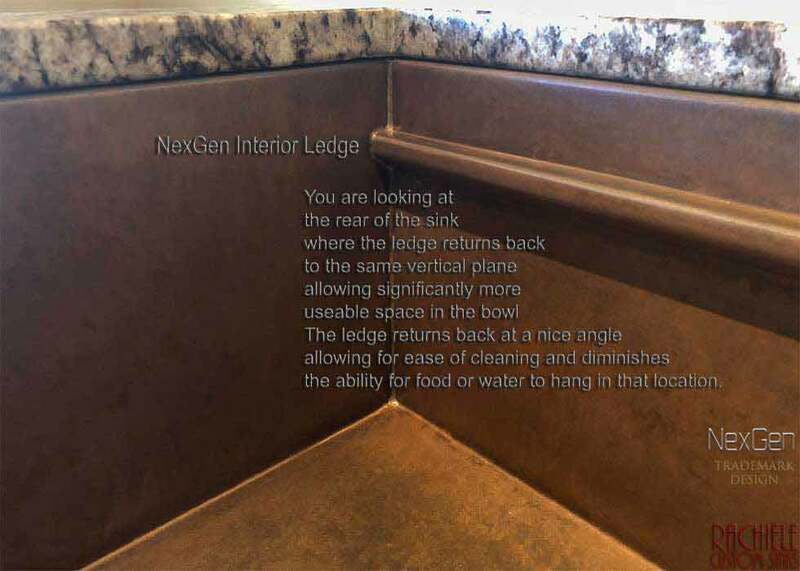 NEW DESIGN FEATURE FOR 2018 NexGen is the next generation in workstation sinks. Up until now, workstation sinks had a "step" that held up the accessories. My new innovative design removes the step and inserts a ledge instead. The sink width remains the same at the bottom as the top. My innovation gives you an extra inch of front to back space in the sink with this option. My design offers 34 additional square inches of space in a 36" sink! We use only pure AMERICAN copper to make our copper sinks. In fact, the copper we use is so rare that there are only two places in the entire United States where it can be purchased. We go out of our way to use domestic copper that is cold rolled. If you are looking at other sources, ask them where their copper comes from and ask for proof of purity. I can offer certification papers for each batch of copper we receive showing the purity of the copper. We use only virgin cold rolled 14 gauge copper, which has a yield strength up to 8 times stronger than annealed recycled copper used by just about everyone else. Why does that matter to you? Well, you hear about 16 gauge, 14 gauge and even 12 gauge copper sinks. If the sink is imported, you can bet the copper is annealed soft copper. We use virgin cold rolled hard copper so that your copper sink will be tough enough to have a lifetime transferable warranty. We could not give a long warranty on an annealed copper sink. I would constantly worry about the integrity after a disposer was in use for many years. There is one company out there that claims there is no difference between cold rolled copper and their annealed copper. Sadly, that is a claim far from the truth. You can Google the question and find out for yourself. This is a quote from Copper.org: "If scrap (copper) is mixed, contaminated or includes other materials such as solder then, when remelted, it will be more difficult to adjust the composition within the limits of a chosen specification. Where lead or tin have been included, but no harmful impurities, it is usually possible to adjust composition by the addition of more lead or tin to make leaded bronzes. For some scrap contaminated with undesirable impurities it is sometimes possible to dilute it when melting so that the impurity level comes within an acceptable specification. All these techniques retain much of the value of the scrap." There are many import companies that claim their copper is free of impurities. One such company claims: "When the metal is melted down any impurities are removed." Clearly that company is misinformed. 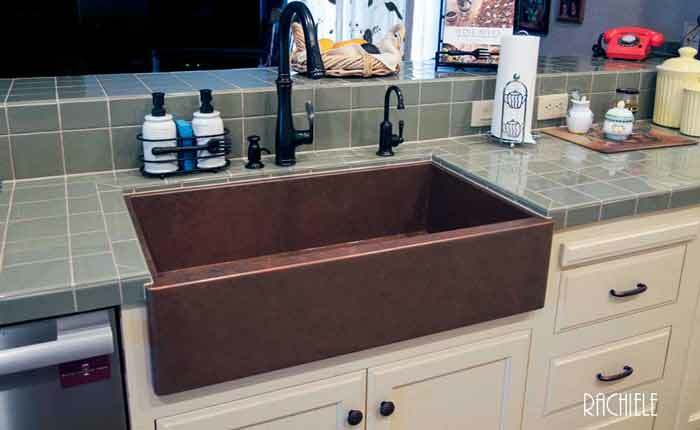 Check out our copper farmhouse sinks. They are quite different than all others... Scroll through photos by dragging your mouse over the photos right to left. This copper farm sink features a stencil patina on the apron of the sink. You have the ability to custom design a stencil with the assistance of our patineur. 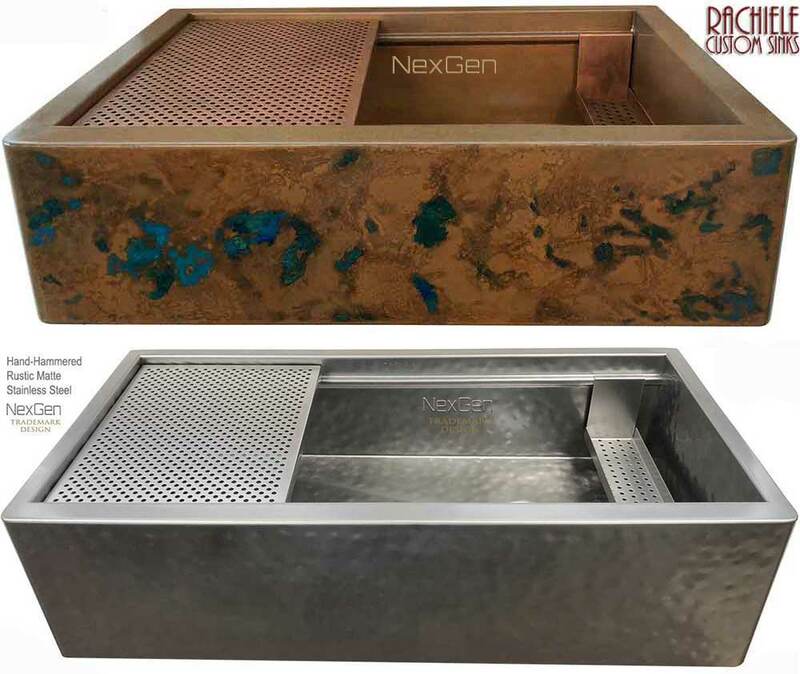 This copper farmhouse sink features my new NexGen Trademark Design. There is a ledge instead of a step to hold accessories. That feature adds significant usable space inside the basin of the sink. This design is unique to Rachiele. Interior width is increased from 16 1/2" to 17 1/2". This copper farmhouse sink features our Linen Patina on the apron of the sink. This patina option requires a great deal of skill and patience. Our "Rustic" patina is gaining in popularity on our farmhouse copper sinks. You can request specific colors, like greens, blues, blacks, etc. We will make sure you are thrilled with the result. I'm not afraid to show you my bottom! Take a look at the bottom of my farmhouse copper sink. Notice the bottom of the apron is completely closed. You will rarely find a photo of the bottom of an import because the aprons are almost always open on the bottom. The bottom and sides are closed on my sinks. We are likely the only company that can offer patina options like this. I started working with copper patina on copper sinks back in late 1998. We constantly develop our own products for creating these awesome works of art. 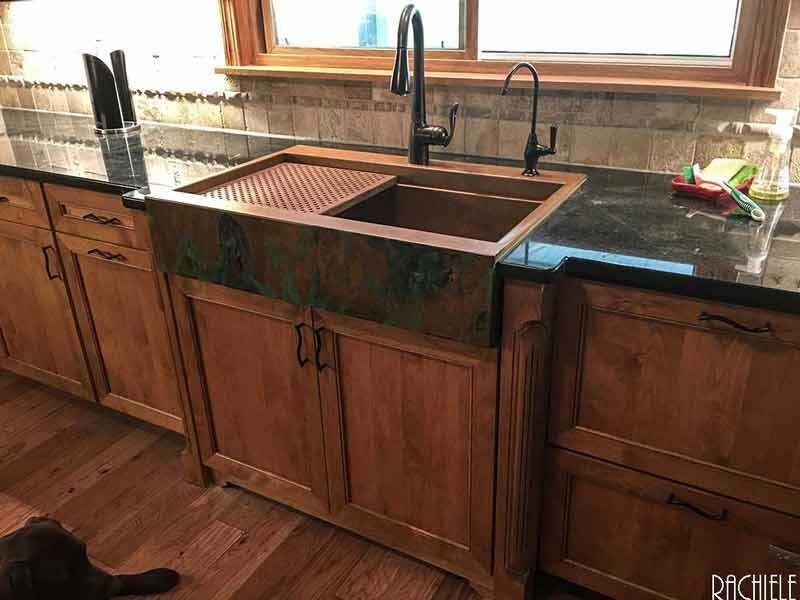 This is one of hundreds of top mounted copper farmhouse workstation sinks that I have designed to replace existing outdated double bowl sinks. Recent custom farmhouse sink featuring our Fire and Ice Patina. Make sure you click on the image to get the full impact of how gorgeous this sink is. This patina is somewhat unreliable. Make sure you have plenty of time if you order this patina. This is a custom stencil that we did to match the pattern on a tile the customer had sent us. We can make custom stencils to make just about any pattern or design. Hammered (Rachiele style - real ball peen hammering). The hammering of one sink can take one man the better part of an entire day. The precision of our men is nothing short of amazing. A rustic patina on our copper farmhouse sink. The amazing colors and patterns are very difficult to achieve and this process takes a bit of time. This is a gorgeous copper double bowl farmhouse sink with a mild rustic patina. This whopper of a sink measures 43" long. The apron was made 9" tall, while the bowls are 8" deep. This was done to give the sink more balance in terms of proportion. Truly a beautiful sink. We shipped this baby to its new home December 15th, 2010. First sink of 2011 - a gorgeous rustic patina on a copper apron front farmhouse sink! This is a 33" long apron sink with a 12 inch tall apron. The bowl depth is 8". It features our self healing weathered interior and our weathered/lacquered apron. Our customer was in a big hurry. This sink was built and finished in less than a week! I really love this one! 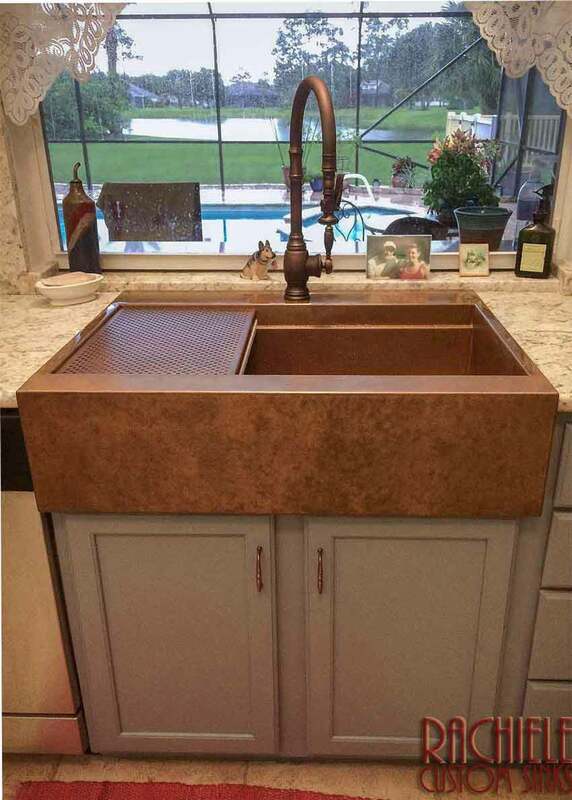 It is a 36" copper farmhouse "Signature Series Workstation Sink", featuring a step in the front and rear for cutting boards, a copper grid, or a colander. The patina is particularly nice. Very rich tones. 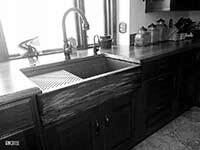 This is a farmhouse sink with our patented channel to slip over existing cabinetry. This sink also had a rear deck to house the faucet and other accessories. 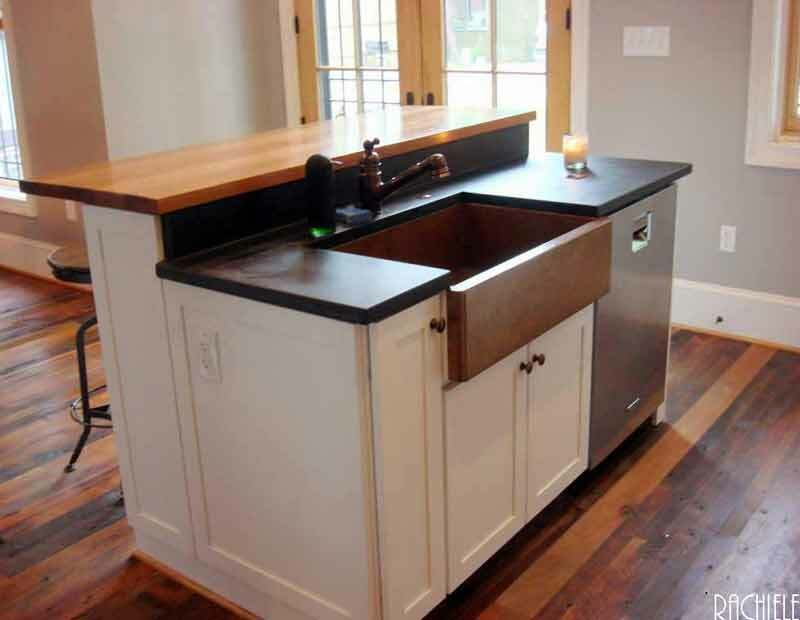 Yes, you can install a farmhouse sink in existing cabinetry - even while using your existing countertops. Another pretty face! Warm earthtones on this rustic patina will look good in just about any setting. This is one of our newest patinas - Cork. This is a patina that I developed. This is a stunning patina that takes a great deal of artistic ability. Thankfully, Lori is up to the challenge. The look is rustic, and we followed suit with a very rustic patina on this copper farmhouse sink. This copper farmhouse sink was ordered for the Dutch Mills Factory Showroom in Goshen, Indiana many years ago. 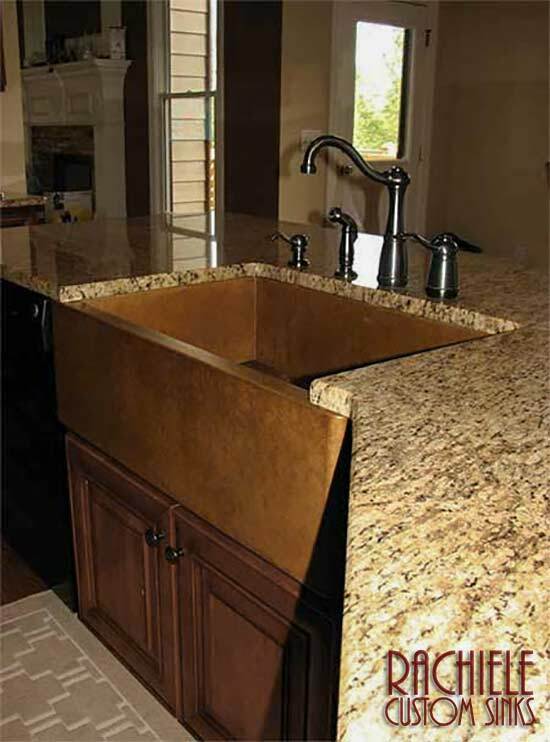 If you are looking for a custom finish on the apron of your sink, just ask. 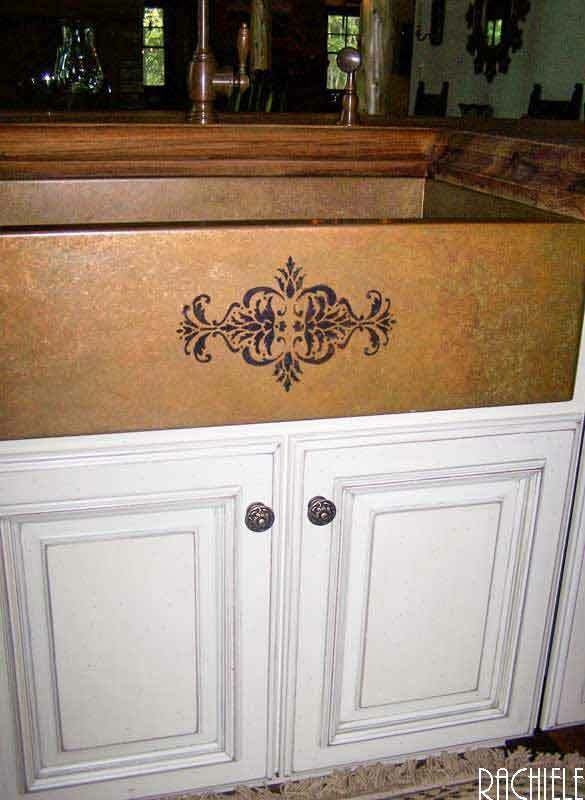 Our artist has the ability to provide a custom color and pattern for your copper apron front sink. We want you to be thrilled when you receive your sink. 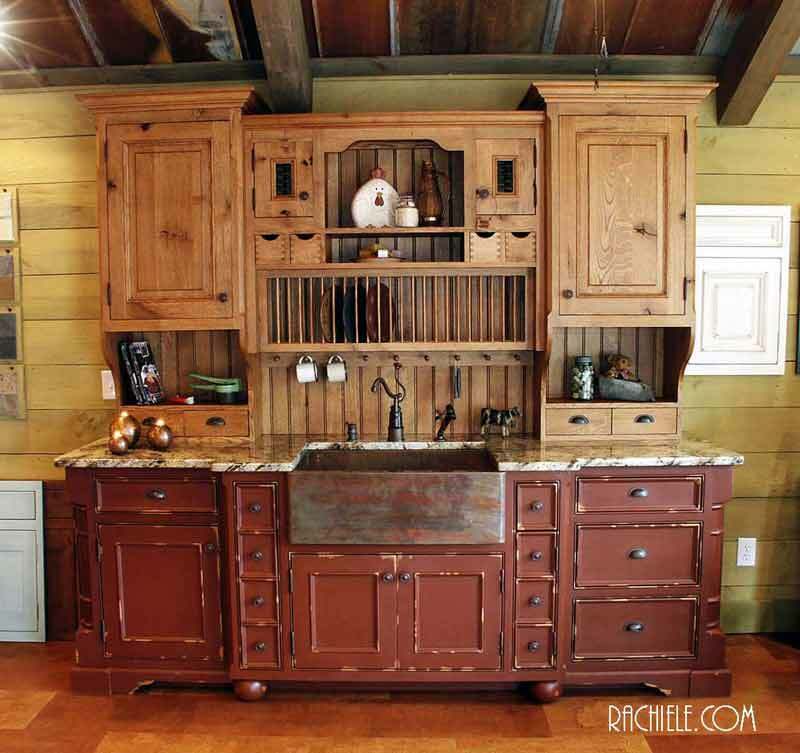 Dutch Mills Cabinetry was considered one of the finest custom cabinet manufacturers in the USA. They were very particular about every detail of the construction of their cabinets. 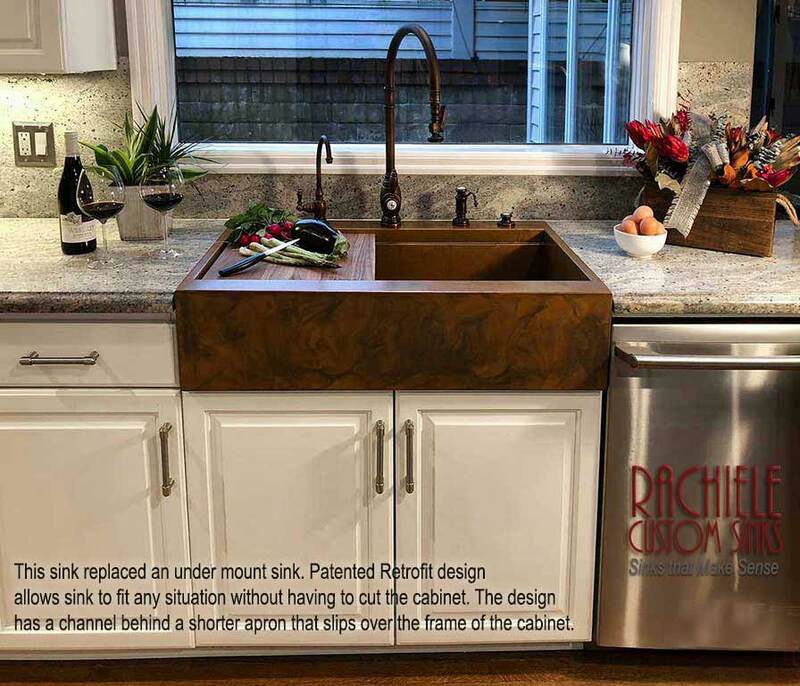 When they remodeled their factory showroom, they were offered free sinks for their displays by several sink companies, but opted to pay for a Rachiele custom copper sink as they felt only our sink would convey the quality they felt appropriate to be integrated into their cabinetry. The request... a very rustic patina on a 30" copper farmhouse sink. This copper farmhouse sink graces a showroom in Clayton, Georgia by the name of The Heritage Home Collection. The Heritage Home Collection is the most exclusive showroom in their region. They insist on the best of the best. They cater to the rich and famous, such as professional baseball players, owners of fortune 500 companies and movie stars living in Highlands, North Carolina and Atlanta. The only copper sink they will represent is a Rachiele copper sink. Copper Farmhouse Workstation Apron Front sink with Rustic patina. This sink shows our custom made walnut cutting board and a Waterstone Faucet suite. Prepare your meals on the sink, not the counter top. 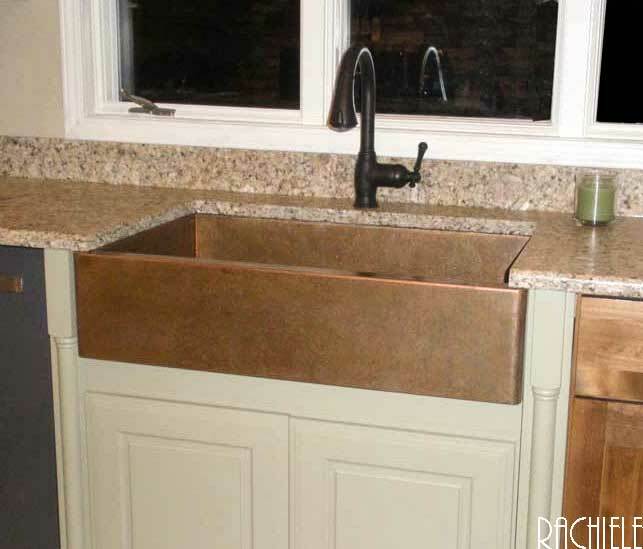 This is a top mounted retrofit copper farmhouse Signature Series workstation sink. It is 36" wide, with plenty of space behind the left sink base cabinet door for a full size double roll out trash mechanism. 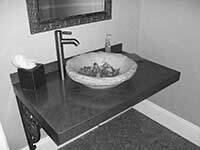 This is one of the very first double bowl farmhouse sinks we ever built back in late 1999. It was requested by General Electric for use in a photo shoot for their Monogram Series Literature. It was hand hammered (and was a double bowl). I have no idea how they heard of us back then! This is a drop in (top mount) retrofit farmhouse workstation sink with a Waterstone faucet. I have literally replaced hundreds of sinks with this patented design. The installation of the sink takes just a few minutes! 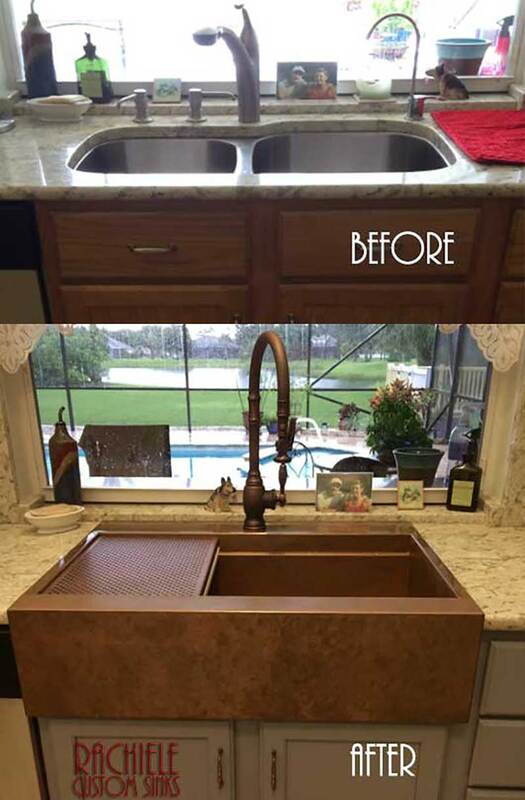 Copper farmhouse sink photo sent in by a past client. The sink features our self healing weathered patina. Our 36" copper farmhouse sink is truly unique. The drain is located in the right rear corner so you can wash dishes on the right and set off on the left. You can also place large items flat inside the sink without covering the drain. Large copper farmhouse sink with two bowls. 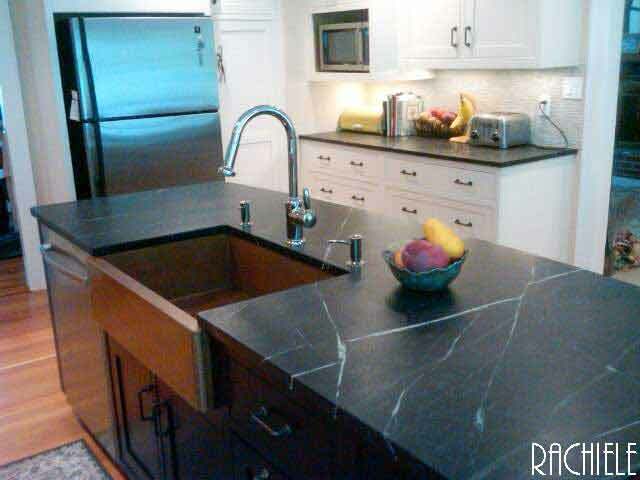 Soapstone counter top. If you must have a double bowl sink, please get one that is at least 45" wide. We ship copper sinks all over the world. Copper farmhouse sink installed in an Asian style home. The sink you see in this photo was our working kitchen sink that had been in use since 2005. We recently sold the sink to a very lovely lady that came into our showroom to buy it. Her name is Stella. She just sent me a photo of the sink installed in her gorgeous kitchen below. As you can see, our sinks pass the test of time. What other 8 year old used sink could be sold for $1500 and look like a new sink? None other than a Rachiele copper sink!!! 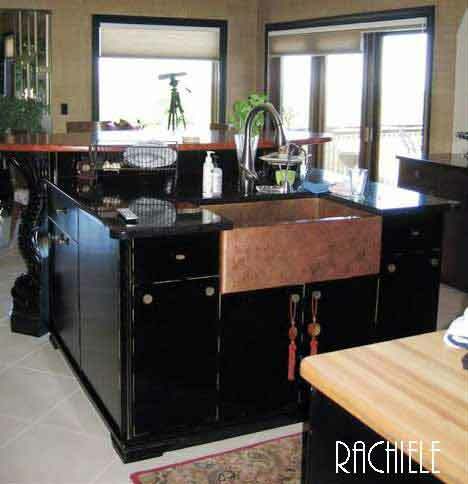 This is a close up photo - notice the gorgeous thick walnut counter tops! This photo was sent in by one of our customers. It shows our farmhouse sink looking great with their awesome looking soapstone counter tops. Nice job! Well we finally finished the kitchen. We actually designed the kitchen around the sink. We made sure that we had a copper colored backsplash and light switch covers & faucet. Even the granite had to have a little rust in it to match the copper. 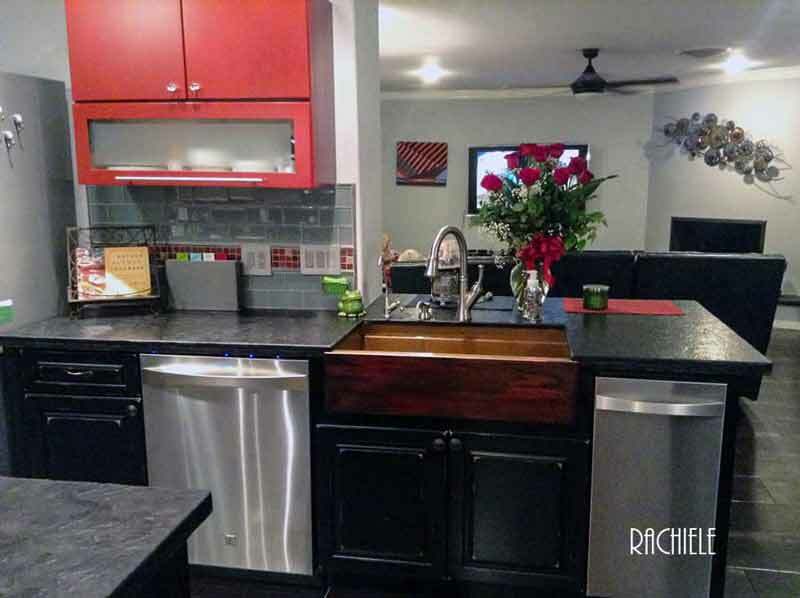 It took us almost six months but the kitchen looks great and the sink is our centerpiece. This is a gorgeous kitchen with a muted earthtone patina on the apron of the Signature Series workstation copper farmhouse sink. The faucet suite is Waterstone and the finish is weathered copper. Weathered copper is a living finish. Notice the handle of the faucet is a bit lighter than the rest of the faucet due to the constant use. This is a 36" copper farmhouse sink in a 36" cabinet. My design allows you to use significantly smaller cabinets for installation than all others on the market due to my forward thinking design. As a former kitchen designer, I designed my sinks to fit smaller sink bases, as sink cabinets are generally not efficient cabinets - until now! My sinks are shallower than most, and the drain is located in the right rear corner. 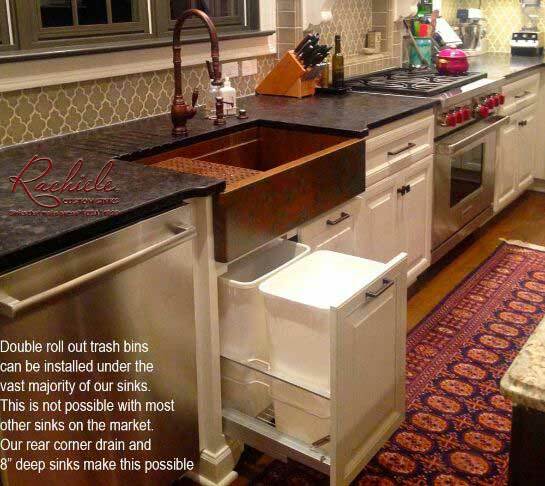 You can fit full size double roll out trash bins behind the left sink base door! Who says copper sinks don't look great in a white kitchen? Not only does the sink look great, look at the polished nickel faucets and the stainless island sink. I don't think you could possibly say these do not look great together! This sink replaced an outdated under mount double bowl sink. I replace outdated sinks almost daily, with my workstation sinks. Don't invest in the past, invest in the future of sink design. 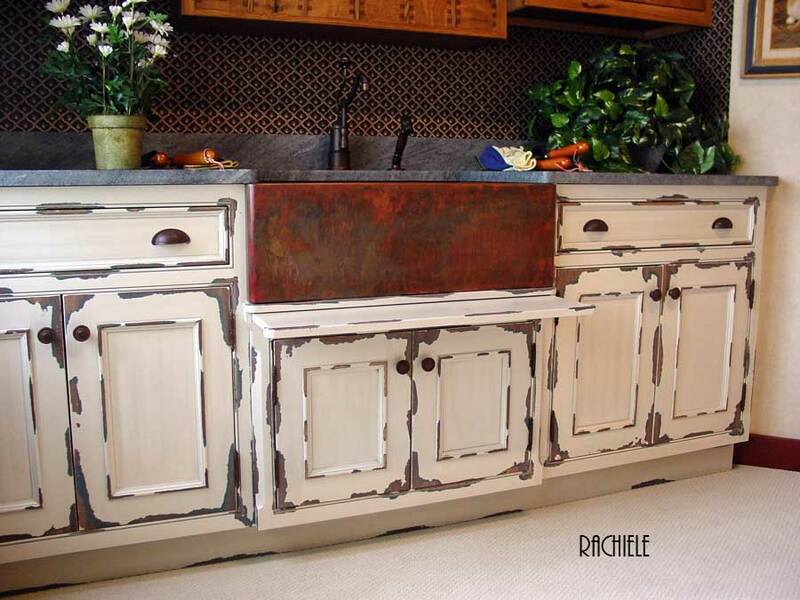 This French Country Kitchen shows one of our copper farmhouse sinks with a weathered patina. 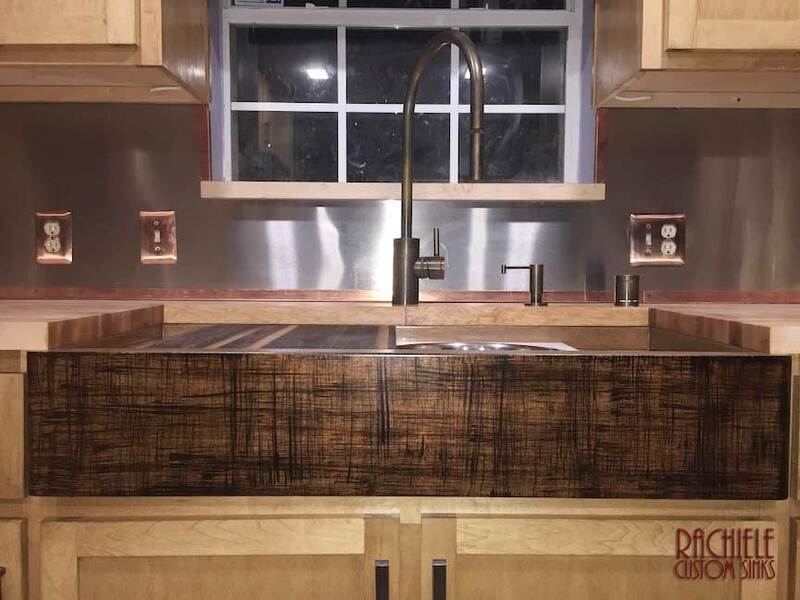 Sunset patina on this farmhouse sink ties in the black and red cabinetry! Yes, It can be done and it can look awesome! 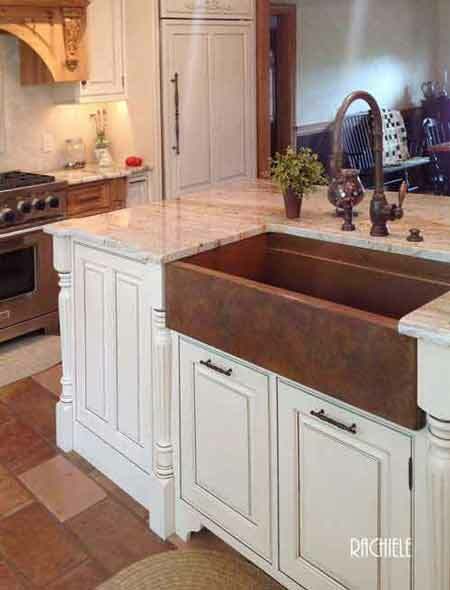 Clever installation of one of our 36" copper apron front farmhouse kitchen sinks using tile counter tops. Copper apron farm sink with Fire and Ice patina and an 18" copper prep sink. 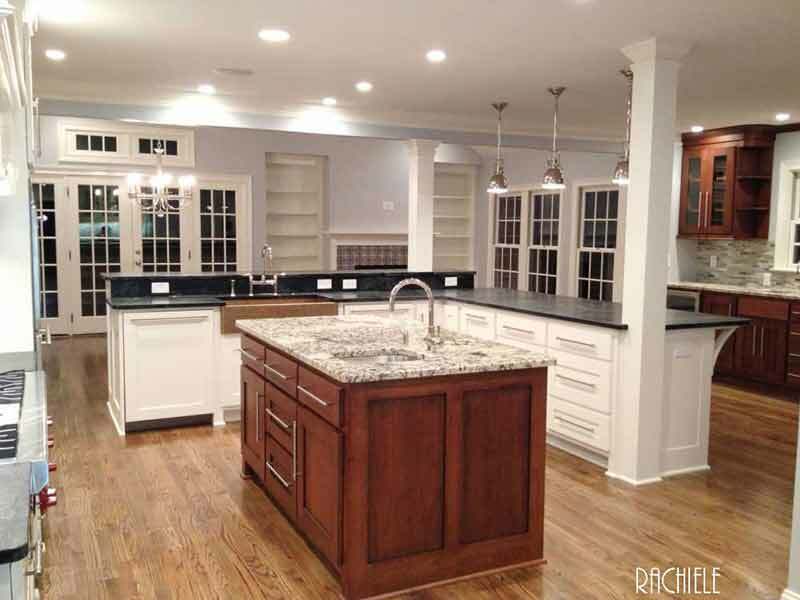 This kitchen is simply gorgeous! Copper apron farmhouse sink with Fire and Ice patina and a Waterstone traditional pull down faucet, hot/filter faucet and soap dispenser in black oil rubbed bronze finish. I love to talk about copper sinks so call me! 407-880-6903 Shop Now!